The other day I went to the Saturday Farmers Market in Amherst. It is the only day of the week that I even try to make myself presentable. When you work from home, or are involved with sheep and lambs in the depth of winter, all thoughts of cleaning yourself up kind of evaporate. When I got home from the market, I couldn't figure out why I was so cold. And then I realized, it was the first day in weeks that I hadn't had two layers of pants on, including a pair of wool ones. Layers of wool really help keep you warm. Also, wearing a wool hat inside has become normal. Wool fiber is probably why the sheep do not to seem to be bothered at all by the unbelievable cold we are having. 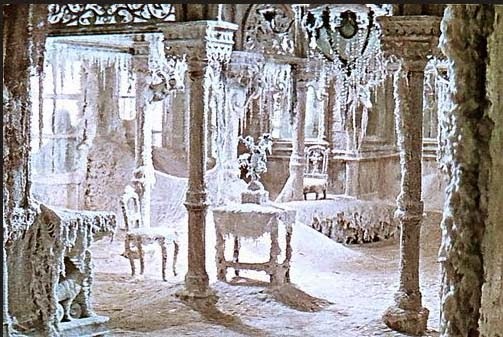 Recently, I have been thinking a lot about the movie Dr. Zhivago. Do you remember this scene? And the interiors of the farmhouse Lara and Yuri go to escape in. I must watch that movie again. If you haven't ever seen it, totally worth a watch. This morning, the pipes in the kitchen sink are frozen. Once again, a first for us living here in this farmhouse. I must admit, I have never experienced frozen pipes! The kitchen pipes run along the outer wall of the house so I shouldn't be surprised. Luckily, the rest of the pipes in the house are fine. I'm working on thawing them with an electric heater. It is supposed to be this cold for several more days. I've been wanting a new pair of knit barn gloves. The pair I have been wearing for years have had all the fingers re-knit at least once. Because my gloves are going to be barn gloves, I thought it might be advisable to use a superwash wool. I grabbed a skein of my Regia Design Line Sock Yarn and a skein of my old Best Foot Forward Sock Yarn (from the Nashua days). My plan was to double strand them and see what happens with the colors. I also tried triple stranding the sock yarn but the fabric was a little too heavy. I cast on and knit. I used a basic glove pattern similar to one from Ann Budd's "The Handy Books of Knitting Patterns" (great book - highly recommended - basic patterns in many, many gauges). Here is what they looked like before washing. I love how the colors mingle together in no particular pattern or order. Below is what they look like after washing. The fabric stretched out a bit in length but I think they will work out fine. I must admit though, I do prefer wool that isn't "superwash treated." I like the grab it has vs. the silkiness of the superwash. 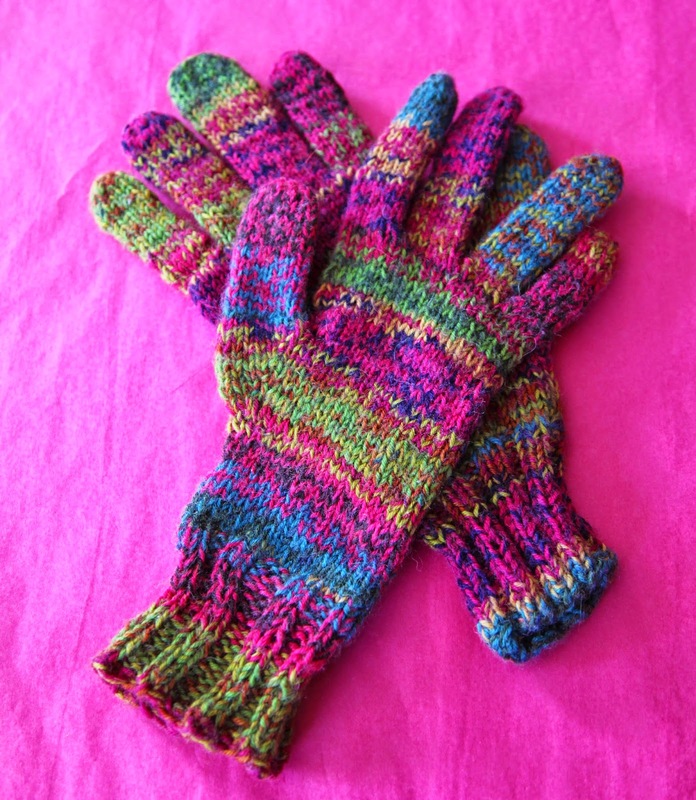 I think I may make another similar pair of gloves but just use my basic Color By Kristin. By using my link, you will help me generate a little bit of money, and get yourself a nice discount. Check out my Craftsy class Stitch It With Wool: Crewel Embroidery. I myself have been wanting to take the Craftsy class on the photo program Lightroom. I must do it soon. This just in from Stephanie - one of my students from the Summer Crewel Class here at the farm. 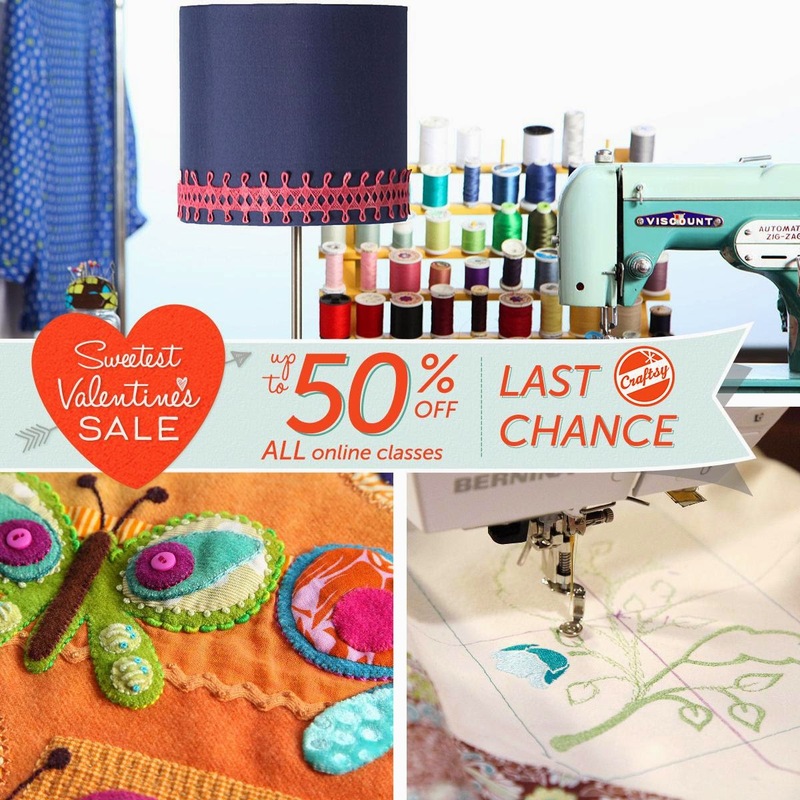 Stephanie also has taken my Craftsy crewel class on-line. 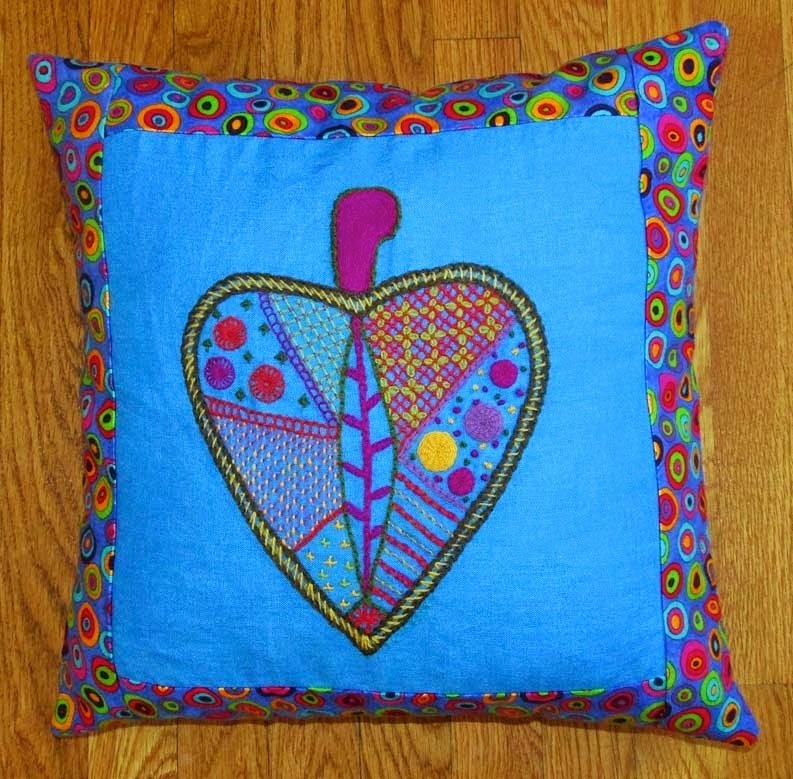 Her finished pillow is shown above. She edged the block with some pretty quilting cotton. Isn't it gorgeous? I love how everyone's pillow looks different because they change up the colors. Nice job Stephanie! Talk about the power of suggestion. I watched Dr. Z in the middle of summer, when it was HOT and had to get under an afghan. Those winter scenes looked so cold. Dr Z is one of my favorite movies. It is minus degrees where we live. Luckly our pipes are okay so far. Great idea for the gloves, thank you. Try to stay warm. LATER, when the snow is gone, you'll need to get some fiberglass insulation in that wall to protect those pipes. Until then, perhaps stacking any hay bales [or whatever] against that outer wall might help - IF it won't be a "fire" issue. Or, prop up some plywood sheets [actually, some large cedar branches might work as well] against the wall at an angle so that there's about a foot of air space, then pack some snow on the outside -- sorta igloo an air pocket. But keep the snow from contacting the wall or you'll end up with worse issues later on. Some times, keeping the faucets slightly open to drip will help, but since you're on a well [right? ], that might be problematic. Then again, it might be a good idea to do so when thawing those pipes so any heated air pressure won't bust the joints... BTW, if there is any exposed piping that's frozen, you could try some "heater"-bags..? Or warming stones..? whatever... Hopefully it'll warm up soon... BTW, the windchill has been -40 up here for the last day or so! Right now, anything above -25C is a "heatwave"! 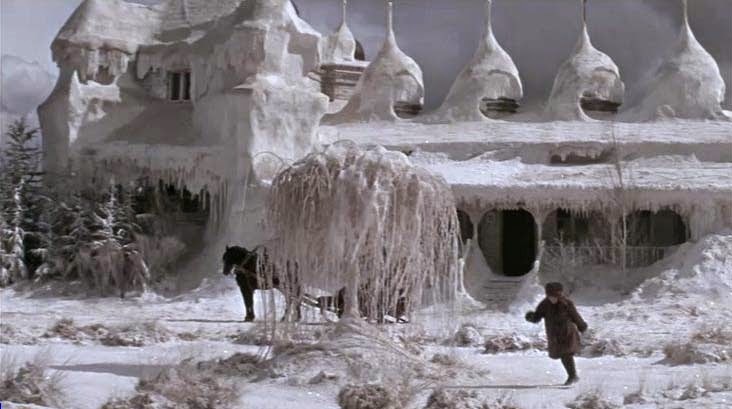 So sorry to hear about having frozen pipes. In my prior home, the bathroom sink would sometimes freeze. I used to leave the faucet with a slow drip, if I was concerned. P.S. Your gloves are beautiful and I really enjoyed your student's finished pillow, as well. 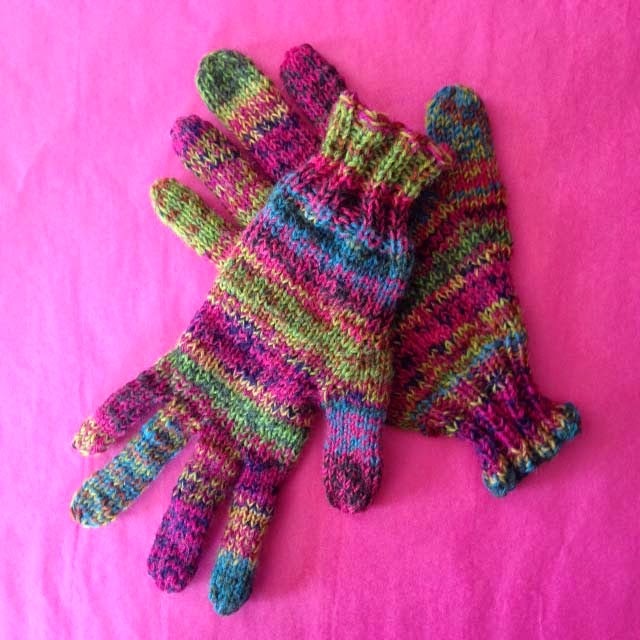 Kristin, your new barn gloves are beautiful! I love the effect you achieved by mixing the yarns...akin to the Noro glow. This winter is really getting to be a bore. I imagine that spring's eventual arrival will be celebrated in a big way. I saw Dr. Z. three times in the theater and anticipated the ice house every time. It is so beautiful! Now I think I need to rent the movie from the library and watch it again. Your gloves are so bright and colorful. 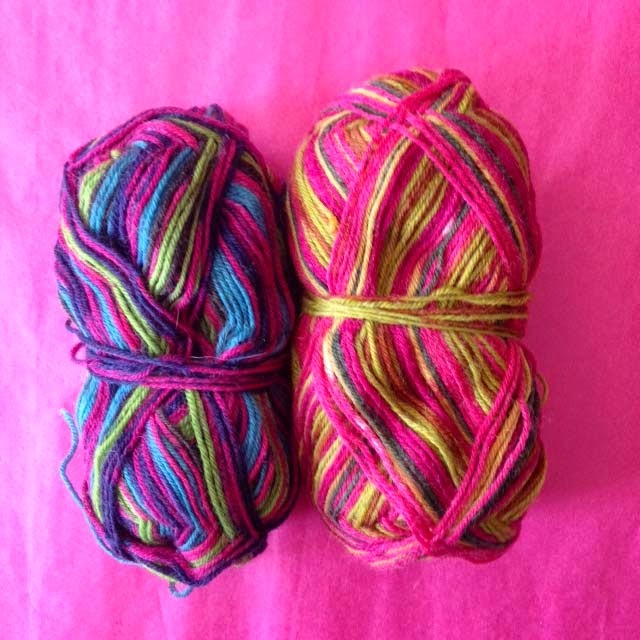 I know I wouldn't have thought of combining those two yarns, but I love how they turned out. You did a great job on those gloves! Mine always come out looking like a critter has chewed the fingers. My frozen pipes tip: use a hair dryer for thawing those "hard to reach" areas!! Those scenes in Dr. Z were so romantic. Less so in real life, I'm afraid. Here on the Cape we are beginning to think any temperatures higher than 20 are quite comfortable. Endless Winter! Be well & bundle up. Glory be! Last night I got to meet one of my color idols, Kristin Nicholas, and it was wonderful. You gave a great slide presentation and entertained us with colorful images and wry commentary. As I said last night, I have followed you and your hues for about 30 years and I have always been charmed by your bold designs and juxtaposed shades. Your newest book, Crafting a Colorful House, is a gem and I feel proud to add it to my library of other KN books. Thank you for a delightful evening and being a bright spot in this otherwise endless and dreary winter. Here in MN they sell heat tape for pipes. Only good if you can reach them, of course.